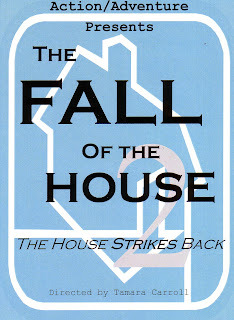 Action/Adventure brings you the second season of FALL OF THE HOUSE: The House Strikes Back, directed by Tamara Carroll. There are a few old faces and some new ones too. I saw this show last night and was blown away. I saw only one episode last season and was impressed with this improv theater soap-opera thing. It was new, it was exciting and each night it was different. What a concept! Fresh theater every night coming to you live. This show captures communal living at it's worst and at it's best. If you live in SE or know someone who does you will definitely relate to these characters. It will make you laugh and it will make you cry. It is soo good you hardly know it's improv, by this I mean no one looks lost or stuck on stage. Actors are smart and well directed. They clearly know their intentions and tell a tight, touching, and hilarious story along the way. I highly recommend this production and seeing as many episodes as you can. It plays for four consecutive weekends in the late night spot (after Profile Theater's SIX DEGREES OF SEPARATION) in Theater! Theater! (3430 SE Belmont). For more information check out Action/Adventure's website and to make reservations e-mail: reservations@actionadventure.org or call 503-358-8646. Thursdays are always "Pay What You Will"
To hear what other people are saying about this phenomenon, check out The Portland Mercury's review. I met up with my friend Lora for breakfast this morning. 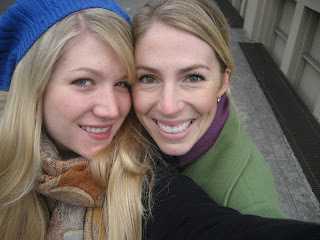 Lora and I went to Santa Clara together and then the both of us transfered to other schools. It was really nice to catch up with her. After breakfast we walked around and tried to find the theater. It was a really good thing we took the time to search because it was difficult to find. 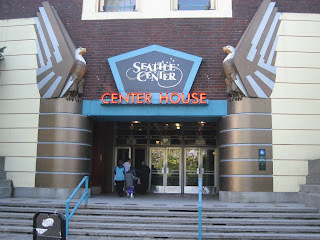 Book-It Rep lives in Center House Theatre, which is located right behind the Experience Music Project in Seattle Center. SNOW FALLING ON CEDARS was adapted and directed by Kevin McKeon. The stage had cedar sod on the ground, which when the actors played around in it you could smell it. I love the smell of cedar. It reminds me of my dogs because their doggy beds were full of cedar. The court room was located upstage and just behind the courtroom window you could see the shadows of a cedar forest with snow falling steadily. I really enjoyed this show. It was 2 ½ hr show but it kept me entertained the entire time. I feel like I have to say that I went into the show having never read the book or seen the movie, so I had no idea where it was going. As you might remember it takes place in a court room, but what was especially lovely is that the person on the stand never just sits there and talks about what happens. Their testimony and back story is played out in front of courtroom. This keeps the story moving and made it worth sitting through. Also it was fun to see our friend Eddie Levi Lee in the cast. He was part of JAW last year in Jason Grote's BOX AMERICANA and in David Adjmi's MARIE ANTOINETTE. And to my surprise my train left on time and even got in a little early. I got to see the most beautiful sun sets. Unfortunately my camera didn't quite capture them well enough, but you can still tell they were beautiful. 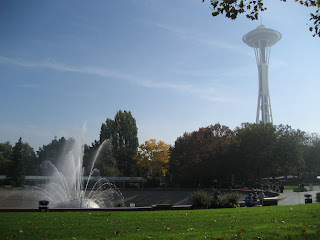 I am off again—this time to Seattle. Our poor Mr. Mead was really sick, so I went in his place on a trip to Seattle to scout out some new plays that are being produced up here. Often times theater companies will see each other's work to see if it is a script that they would like to consider for their upcoming season. That was the mission of my trip. As a representative of Portland Center Stage and specifically the Artistic and Literary department, I am constantly seeing shows in Portland to support local theater companies and to get to know the people and the work that is going on in town. I’m also interested on a personal level because I hope to direct someday for these companies. How lucky am I that both my work and personal life overlap in this way? 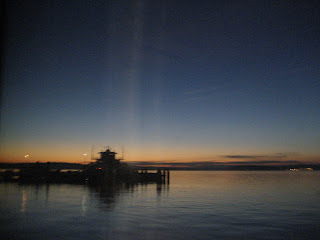 For of those you who have taken the train from Portland to Seattle and back again, you know that the train is never ever on time. This time I was lucky, we only waited an hour in Portland for a connecting bus before taking off. I’m sorry but can’t we put those people on the next train? Just because their bus is late, why am I supposed to suffer? I got here on time expecting my journey to take off on time and it NEVER does. Why is this allowed to happen? 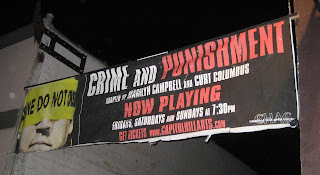 Whatever, bitching aside, I got to Seattle with enough time to check into the hotel, get some food, and catch a cab to my first show: CRIME & PUNISHMENT adapted by Marilyn Campbell & Curt Columbus based on the novel by Fyodor Dostoyevsky. Theater Under Ground produced it at the Capitol Hill Arts Center, which is also an event venue. The show was held in the basement, which only added to the fringe/exciting edgy theatre feel. The place was full, mainly due to the fact that two professors had brought their beginning acting classes from Seattle University to see the show. Oh young theatre people, doesn’t that just inspire you? I had read this play last year when it was submitted to us for consideration and really liked its pace. For an adaptation of Dostoyevsky’s novel, it moved well. This production honored the script in this way. The transitions and use of the space was excellent. The director Sheila Daniels, who is also the Co-Artistic Director of Theatre Under Ground, chose to stage it in traverse (also known as Lane) seating arrangement. Shocking! The last time I saw a production staged this way was in college. I know for me this was not long ago, but still it is very rare to see a theater outside of college use the space this way. Whether or not this was her choice or the space commanded it to be this way is up for debate. I suspect it was her choice. Hats off to you Sheila. As we walked into the space and chose our sides, we could hear a pre-recorded Raskolnikov reciting his writings. Two burlap curtains hung on either side of the stage in front of the audience platforms. Fences on the edge of these platforms automatically gave the audience a separated or judging feeling. On the short side of either side of the stage were three staggered burlap curtains, which was where characters were able to enter and exit. The audience curtains were pulled back and forth by characters to denote a scene change. The sound of the rings on the steal rods made a very jarring sound like that of prison shackles, which helped to create an anxious feeling. In fact of the sound ques were done live. And the only draw back from the space, was that during very intimate moments on stage, loud crashing and stomping sounds would come from the upstairs bar area. It seemed like they knew exactly when the actors were having a quite and intimate moment and chose it as the perfect opportunity to start a mosh pit or some sort of fight/wrestling match upstairs. Props to the actors for keeping it together during these unexpected and additional sound effects. In the program was an advertisement for Portland own Hand2Mouth Theatre. They are coming to Seattle November 1-4 and performing at On the Boards. How exciting! Congratulations guys! Seeing the show tonight was helpful. You may think you had a good sense of how to stage a play (or at least see how it might be done) after reading a script, but it is another thing to see how the play makes sense out loud. I'm really enjoying my trip and looking forward to my show tomorrow: SNOW FALLING ON CEDARS adapted and directed by Kevin McKeon at Book-it Rep. Co-Artistic Director Jane Jones will be directing our production of TWELFTH NIGHT which will be done in rep with BEARD OF AVON by Amy Freed. Jane is an amazing director and I can't wait to see her work at PCS. In fact, Jane and Chris are in New York right now to finish casting both shows.